The Directional Trend Index by William Blau may be used to determine if a stock is trending and also identifies overbought and oversold conditions. The Directional Trend Index (DTI) is a good indicator for those traders who want to assess strong trends and enter when these trends are strong with increasing momentum. Just like other indicators, DMI can be applied to any market and time frame, although it was created by William Blau to address those stocks in the S&P500. DTI has the same characteristics of an oscillator in terms of looking for overbought and oversold conditions. Adjustable guides on the indicator are given to fine tune the signals. The user may change the method (EMA), period lengths and guide values. The standard settings use 5, 10 and 14 EMAs in the calculations. By adjusting the top and bottom guides, you can control the quantity and quality of the trading signals. DTI values above 25 are considered to be overbought and therefore offer an opportunity to sell. DTI values below -25 are considered oversold and present an opportunity to buy. If the DTI peaks above the top guide a sell signal will be generated. Conversely, if the DTI troughs below the bottom guide, a buy signal will be given. The zero line divides the bulls (above) from the bears (below). The DTI is a trading indicator that calculates the increasing momentum of the highs in an uptrend and the decreasing momentum of the lows in a downtrend. The slope tells you how strong or weak the trend is. For example, if the slope is steep above the zero line, it means that price is continuing to make new highs at an increased pace. Buying the market at that point is a prudent choice. Once the slope of the DTI flattens out, it means that momentum is waning and price is running out of steam. You may even see divergence at that point, which means that either a sideways correction or a steeper correction is due. When the arrow appears on the indicator in an uptrend, it signifies an overbought situation and potential sell. When the arrow appears on the indicator below the zero line, it signifies an oversold situation for a potential buy. The DTI is similar to Welles Wilder’s Directional Movement System but William Blau added a zeroline to it, where the indicator is either in positive or negative territory. A stable or strong uptrend is a period of time when the DTI is positive and rising above the zero line. A downtrend is when the DTI is below the zero line and falling. In the 4-hour S&P chart below, I lined up the buy and sell signal arrows with the Elliott Wave counts. Starting from the left, the first sell signal lines up with the top of wave 1. Moving to the next red vertical line, the buy signal lined up with the end of wave 2. Line 3 coincides with a wave 3 of a larger wave 3 (so selling here doesn’t produce any profits as the correction was sideways.). 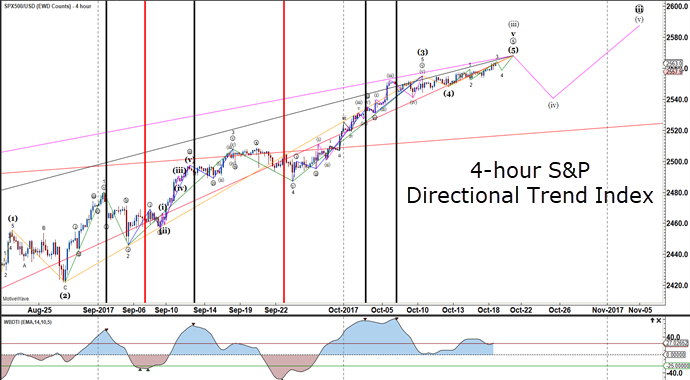 Red line 4 coincides with a wave 4 correction to buy. Black lines 5 and 6 line up with the tops of wave 3 within the larger wave 3, so selling it here produces losses. Some observations: When looking at lines 5 and 6, notice that the slope of the DTI is steep so a rule of thumb is not to pick a market top when the slope is so steep because that indicates strong momentum. Instead, look to buy on dips. Also, in a very bullish market like the S&P, you might look to buy once the DTI crosses the zero-line moving from red to blue territory. Finally, trade both buy and sell signals in a market which is sideways but avoid selling in a strong uptrend. Learn how the Directional Trend Index helps keep traders in the trend as it is progressing. Start incorporating the DTI indicator into your chart set-up. Finally, use the DTI indicator in developing trading strategies with other indicators. This entry was posted in Trading Tips and tagged Directional Trend Index.